Fully aware of the significance and the importance of the 4th Party Central Resolution (12th tenure) on enhancing Party building and rectification; preventing and repelling the degrading of political ideology, morals and lifestyle, as well as the signs of internal “self-evolution”, “self-transformation”, the Party Organization of the Military Region 3 has seriously implemented the Resolution and gained significant initial results. 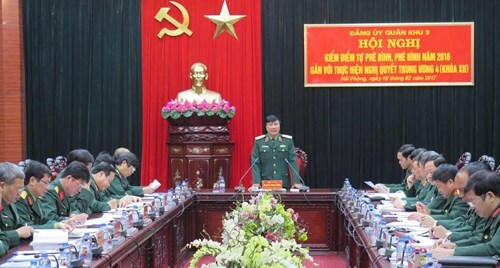 It is a fundamental advantage for the Military Region 3 Party Organization to implement the 4th Party Central Resolution (12th tenure) on the basis of results and lessons gained from the implementation of the 4th Party Central Resolution (11th tenure) and the 11th Politburo’s Directive on acceleration of studying and following Ho Chi Minh’s thought and morality. It can be affirmed that most of cadres and party members of the Military Region possess strong political will and pure, healthy morality and lifestyle, being steadfast in Marxism-Leninism, Ho Chi Minh’s thought and the goal of national independence and socialism. Cadres and troops’ self-study, self-improvement, responsibility, working method and style have witnessed positive changes. The principle of democratic centralism, collective leadership, individual accountability have been correctly understood and practised. Inspection, supervision, practice of the Party discipline, assessment and classification of party organization and member have been conducted seriously and closely. However, the work of building the Party and training cadres and party members in the Military Region Party Organization has still exposed limitations and weaknesses in political education, management of ideology; management and improvement of cadres and party members’ morality and lifestyle; criticism and self-criticism; exemplification of cadres at all levels. Grasping directives, guidance and plans of higher authorities on the implementation of the 4th Party Central Resolution (12th tenure), the Military Region Party Executive Committee has focused on leading and directing the implementation of the 4th Party Central Resolution (12th tenure) with the spirit of resoluteness, persistence and high political responsibility. It has seen the implementation of the Resolution as a central point that needs close leadership and direction; heightening the responsibility of superior authorities and key cadres at all levels for exemplification; raising cadres and party members’ awareness of risks and manifestations of degradation in political ideology, morals, lifestyle as well as internal “self-evolution” and “self-transformation” to proactively set out measures for preventing and repelling practically and effectively. In this regard, the Military Region Party Executive Committee has indentified major issues in the implementation of the 4th Party Central Resolution (12th tenure) as follows. First, enhancing the quality and the efficiency of political and ideological work, criticism and self-criticism. The Military Region Party Executive Committee has required party committees and commanders at all levels to closely and effectively combine the political and ideological education with the improvement of quality of regularity building, discipline maintenance and military administration reform. It has also led close management of press and publishing activities and Internet use; directed the Military Region Newspaper to open a column on Party building and rectification to timely propagate the results of the implementation of the Resolution to cadres and soldiers; stepped up the activity of the Force 47 to timely recognize and combat wrongful and hostile viewpoints. The Military Region Party Executive Committee has directed its Department of Politics to build up guidance on review, assessment and classification of party organizations and members in light of the 4th Party Central Resolution and the Politburo’s Directive No.5-CT/TW (12th tenure). Review, self-criticism and criticism must focus on accurately recognizing and identifying 27 manifestations of degradation in political ideology, morals, lifestyle as well as “self-evolution” and “self-transformation”. Review, self-criticism and criticism should be carefully prepared, conducted at high-to-low levels, and closely combined with supervision, inspection and punishment for violations. Military party organizations of the 9 provinces (or cities) should perform this task under the direction of local party committees. Self-criticism and criticism according to the 4th Party Central Resolution (12th tenure) must be in line with the implementation of the Politburo’s Directive No.5. Second, supplementing and completing regulations to proactively prevent the degradation in political ideology, morals, lifestyle as well as the signs of internal “self-evolution” and “self-transformation”. Preventing and curbing the degradation in political ideology, morals, lifestyle as well as the signs of “self-evolution” and “self-transformation” constitute a struggle against “internal invaders” - the enemy inside cadres and party members. Thus, alongside education and propagation, there must be strict regulations for cadres and party members to follow. First and foremost, the Military Region Party Executive Committee has required cadres and party members to write commitment to maintaining morals and pure lifestyle and preventing the degradation in political ideology, “self-evolution” and “self-transformation”. Units and organs should thoroughly grasp and effectively implement resolutions, directives and guidance of the Military Region Party Executive Committee; promoting democracy, solidarity, maintaining discipline according to the Regulation 104-QĐ/QU, dated February 16th 2016, by the Central Military Commission. Units and organs must continue to grasp and serious implement the Resolution No.82 and the Conclusion No.133 of the Military Region Party Executive Committee on strengthening the leadership of party committees over the observance of the law and the practice of the military discipline in the armed forces of the Military Region; supplementing regulations on the practice of thrift and civilized lifestyle. Accordingly, the Military Region Party Executive Committee has required the strict implementation of regulations on asset and income enumeration; led and directed the management and the use of budget in accordance with the 2015 State Budget Law; concretized legal norms and regulations, enhanced the efficiency of planning, investment, basic construction, management and procurement of equipment. It has also issued a Resolution on management of defence land; directed withdrawal of state capital from joint stock companies 369, 389, 3/2; equitized Duyen Hai Company. Third, improving inspection, supervision and exercise of Party discipline. In this regard, the Military Region Party Executive Committee has added inspection and supervision of implementation of the 4th Party Central Resolution (12th tenure), the Politburo’s Directive No.5 and the Central Military Commission Standing Committee’s Directive No.87 to the inspection and supervision plans of party committees and inspection commissions at all levels. Moreover, it is necessary to seriously follow new regulations of the Central Party Committee and the Central Military Commission on functions, tasks and authority of inspection commissions at levels; concretize regulations on handling manifestations of degradation in political ideology, morals, lifestyle as well as “self-evolution” and “self-transformation”; focus on inspecting party organizations and members with the signs of violation; successfully carry out the work of inspection, prosecution, judging, penalty execution according to authority; closely work with the public security and other forces in the area to detect and combat organizations and individuals opposing the authority and taking advantage of democracy, human rights and religion to sabotage the Party and the State. Completing the focal points identified by the Military Region Party Organization is the responsibility of all party committees, commanders, organs, units, cadres, party members and staff in the whole Military Region, contributing to building pure, strong party organizations, comprehensively strong organs and units, successfully fulfiling the military and defence tasks in the new situation.